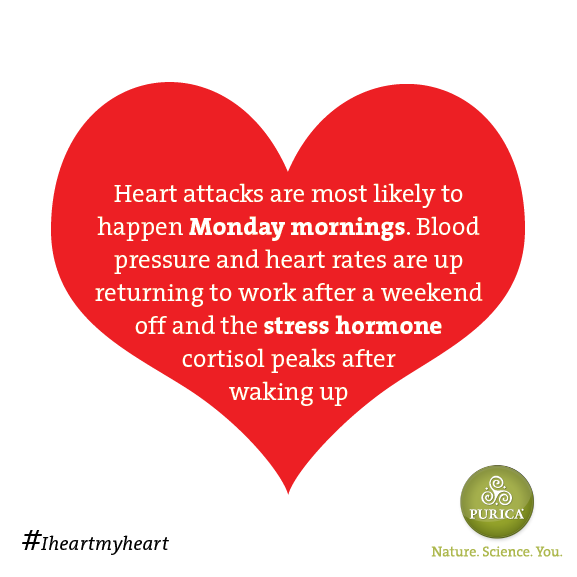 Heart attacks are most likely to happen Monday mornings. Blood pressure and heart rates are up returning to work after a weekend off and the stress hormone cortisol peaks after waking up. Heart disease and stroke costs the Canadian economy over $20.9 billion every year between prescription drugs and disability. Poor diets and lack of physical activity are leading risk factors for heart disease and stroke. Heart disease and stroke is responsible for 66,000 deaths each year in Canada according to 2015 report and claims 700,000 lives in the US, and 7.2 million worldwide. A hearty laugh is good for the heart! Laughing is linked to healthy function of blood vessels. Squeeze a tennis ball tightly; this is an indication of how hard your heart works to pump blood. The heart has its own electrical impulse; it can continue to beat even when it is separated from the body as long as it has adequate oxygen. Your heart starts beating as early as 4 weeks from conception and keeps going for as long as you are alive. Your heart muscle is the hardest working muscle in your body.